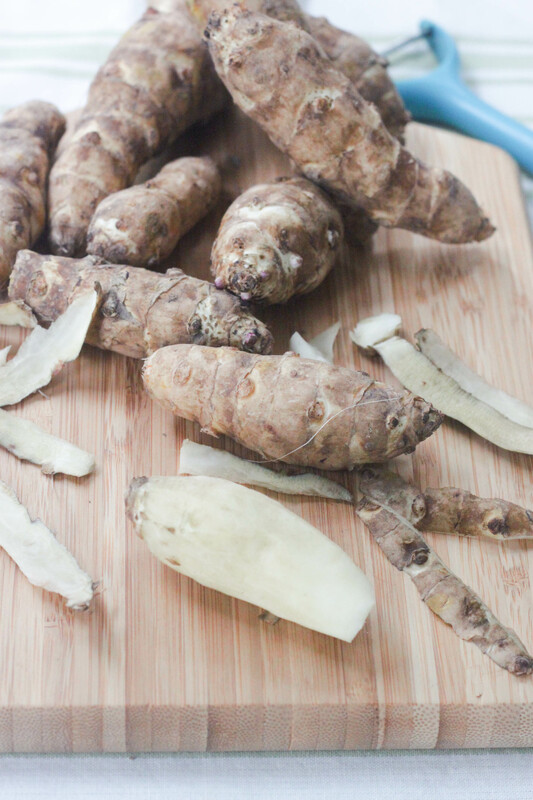 Poor old Jerusalem artichokes are often avoided due to their *ahem* flatulent properties. These interestingly tubular vegetables, which are a cousin of the sunflower, are native to North America and are quite like a mushroomy potato. They’re often found in soups, but I prefer to roast them and use as a base for a banging pasta bake. And I’ve since learned from fellow blogger Stef that roasting them does alleviate their propensity to cause parpiness. Upon seeing a bundle of the ‘chokes in last week’s Home Organics bag, I thought I’d quite like to try them as a topping for a puff-pastry tart. 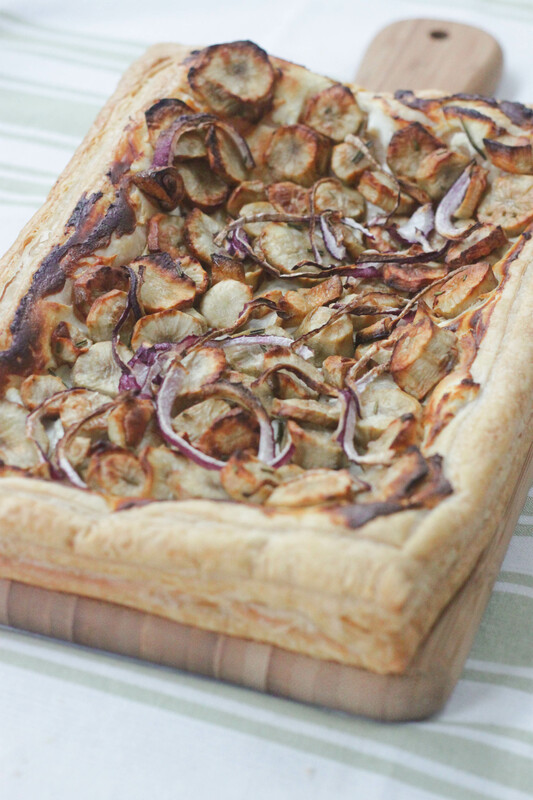 On Saturday afternoon, I rolled out my shop-bought pastry, gave the ‘chokes a bit of a roasting and created a savoury tart that went down very well at lunch time. Peel and finely chop your artichokes. Put them into a roasting dish. 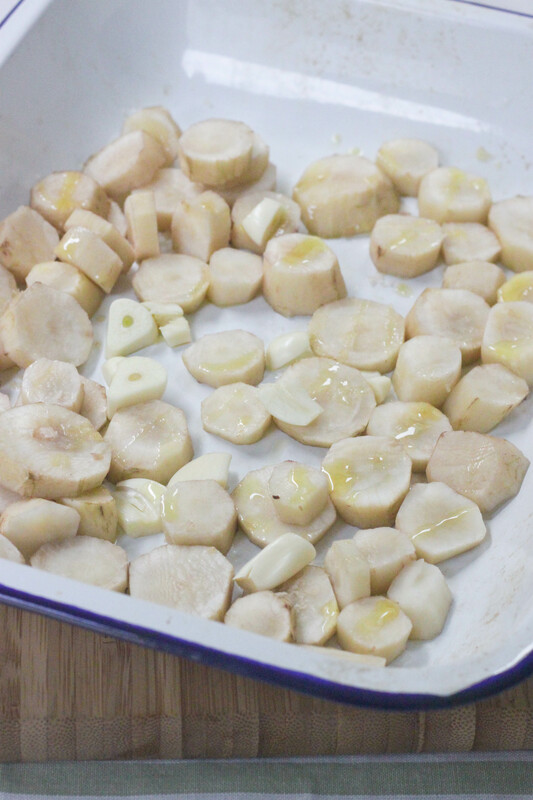 Peel and roughly chop the garlic cloves and add the roasting dish. Drizzle with olive oil and sprinkle with a good pinch of salt. Roast for 30 to 35 minutes until they’re tender. Make sure to shake them halfway through so that they get evenly browned. Meanwhile, finely chop the leaves from the sprig of rosemary and finely slice your red onion. When your ‘chokes are ready, remove them from the oven but leave the oven on. Roll out your puff pastry sheet and put onto a greased baking sheet. Using a sharp knife, score a border into the pastry about two centimetres from the edge. That will help the pastry to puff up around your filling. Spread the goat’s cheese all over the inside of the border. 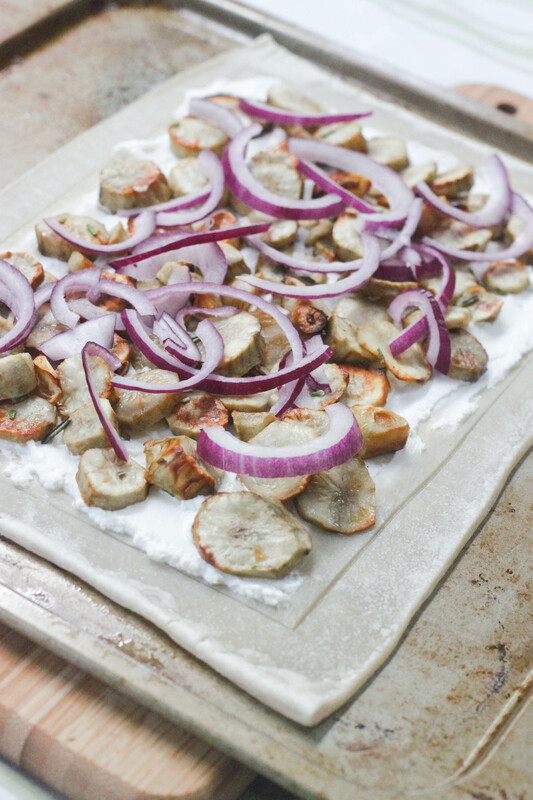 Top with the roasted ‘chokes and sprinkle over the rosemary and the red onion slices. Brush the edges of the pastry with the beaten egg so that it’ll take on a lovely golden colour. Return to the hot oven and cook for another 20 minutes, until the puff pastry has risen and the toppings have taken on a golden hue. Serve for lunch, sprinkled with a handful of grated Parmesan cheese and a crisp green salad on the side. I’m still getting a lot of listening mileage out of Twin Sister’s 2011 LP In Heaven. Here’s one of the tracks, Bad Street, which definitely made an appearance in the soundtrack of our Saturday afternoon. There are jarred Jerusalem articles? Never seen them before. Beautiful pics–the tart looks yummy. Tried roasting them one time and herself was not a big fan. My favorite way to use them is blended into a soup. Has such a creamy mouthfeel you’d swear it was loaded with cream. This tart looks amazing and even better with Twin Sister in the background. Nicely done! Hi Paula and Bill! I think the jarred artichokes are actually the regular globe artichoke hearts, these guys are a little different actually. 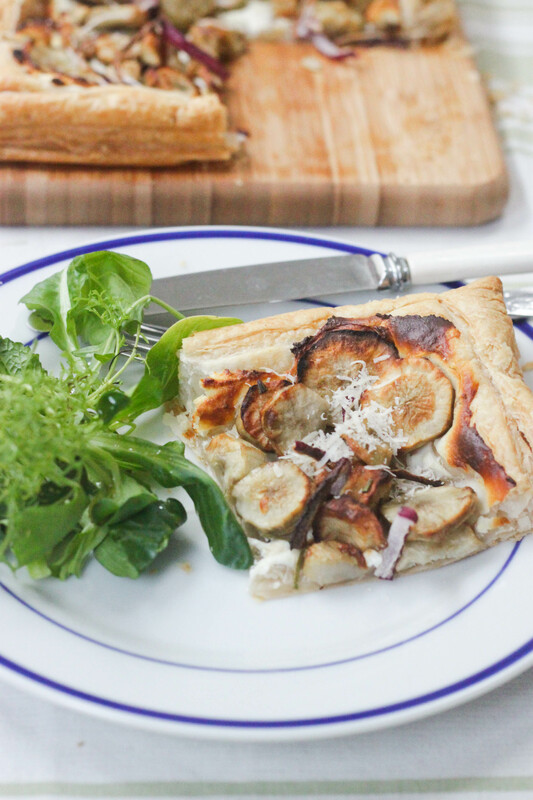 And those jarred artichokes would work beautifully on this tart with the addition of some parma ham. Yumbo! 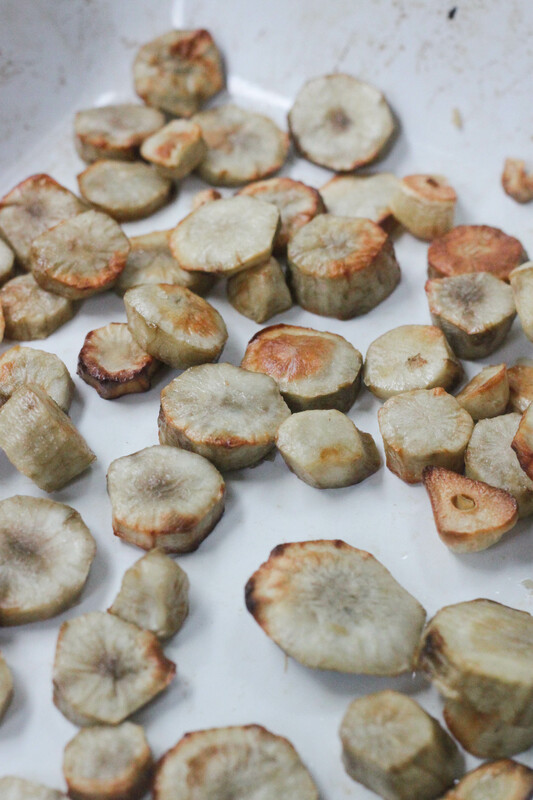 I love Jerusalem artichokes, such a great earthy flavour. The longer you roast them the more you dissipate their unwanted side effects. Also, the more you eat them the more your body gets used to digesting them. That’s definitely a good tip, Stef. I’ve only ever roasted them so seem to have avoided an intense experience of their unwanted side effects! Hi Maureen, thanks for your comment! Specialised prices are annoying, aren’t they? Oooh that looks good… but do you think it’s possible to replace the artichokes with another root vegetable? It’s just I can’t seem to find Jerusalem artichokes anywhere. Hi Marion, thanks for saying hello! They can be a little hard to find, it’s true. I guess you could swap the ‘chokes for little roast new potatoes for a real carb-attack of a tart. But otherwise, I would swap the ‘chokes for jarred artichoke hearts and add some parma ham. No need to cook anything there either!